Located 340 km south of the equator, Mount Kilimanjaro is one of the three mountain open to the eternal snow on the equator, in addition to Cayambe in Ecuador and the Puncak Jaya in Indonesia. As the main object in Tanzania and the symbols of the countries of East Africa, the Kilimanjaro region in 1973 made the National Park, and in 1987 Kilimanjaro National Park (KINAPA) is recognized as a World Natural Heritage by the United Nations. Currently, Kilimanjaro region with Kibo Peak (5895 m above sea level) as the highest roof of the African continent was visited by more than 35,000 visitors each year. Various accessibility, accommodation, security, and professional guide services, enabling more and more people enjoy the natural beauty of this increasingly rare. 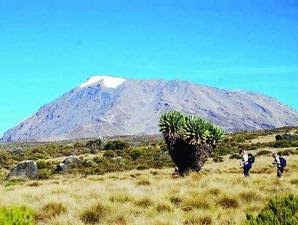 Kilimanjaro as a world natural heritage and to clean themselves in the last 4 years increased more tourists visit tripled. It’s so awsome. Observing nature management in Kili, the way in the mission "Kilimanjaro for Lupus" continues to create awe and envy. Tanzania, a developing country with over 30 percent of the population below the poverty line, capable of highly disciplined. Marangu Gate is one of the 7 routes to the top of Kilimanjaro climbing at an altitude of 1800 m. The building manager's offices met with officials of the 3 candidates are lining up neatly climbers. Small kiosk in front of him, complete with climbing up to the needs of souvenir merchandise. Bathroom facilities to sit and picnic area neat and clean, climbing four bulletin boards, prohibition, appeal and rule on the trim climbing backed wooden board with carved writing easy to read. All the buildings identified with the board pointed out the obvious. No visible trash, but we did not find any trash scattered. The reliable guides help us register and manage logistics with 26 porters, cooks, and assistant guide who is largely a Chagga tribe, the largest tribes in the Kilimanjaro region. The pure natural atmospheres along the 70 km trip up and down us feel so deeply. Flora-fauna we encountered seemed calm is not disturbed. Picnic area in the form of a wooden bench tables, toilets clean cottage and maintained at every 5-7 km journey, 3 cabin capacity of 70 people climbers in Mandara, 148 people and 58 people Horombo on Kibo is ready to welcome. Each cottage triangular structure with bed apartment for 4-10 climbers are wooden buildings with bedding and pillows. The cottage was enough to make our bed more comfortable than the tent. In addition, there are toilets with abundant water, dining hall, kitchen and a special cabin guides and porters, plus a solar panel that illuminates every room ready every night. Good facilities without the user discipline, whatever that means. In the KINAPA guides holding main key in the management of national parks. With the system guides categorized versus reward, they are required continually upgrade our services, natural sciences, technical knowledge of climbing and rescue, and the ability to communicate and speak. Penalty system, a suspension to revocation of license, apply KINAPA management to ensure no violations occur, such as fuel use is not recommended, disturb the flora fauna, the use of the route outside the provisions, negligence guides, and other strict regulations that could stop the source of their income guide . Being a guide is the dream of many residents Chagga tribe who lived around the foot of Kilimanjaro. It took more than 5 years to become the head guide, with the highest rewards. 2-3 years experience with a reporter to forge physique, 2 years of education on the job training as an assistant guide, and finally by KINAPA test for certification guide. Like in developing countries, the welfare of the guides and porters are still an important issue. Huge profits still more absorbed by the tour operators who live in urban areas. Completeness of climbing equipment facility until proper clothing can not always be fulfilled. Until much suffering people and even death. Two major associations formed in early 2003; KPAP (Kilimanjaro Porters Assistance Project) and KGPU (Kilimanjaro Guides and Porter's Union). KPAP the initiative of the International Mountain Explorers Connection, based in America, the fight for the rights of reporters around the world, such as the Annapurna Sanctuary in the area of Nepal and the Inca trail in Peru. Equipment rental services until a proper clothing for free; English language training, to the knowledge of HIV P3K which hit eight percent of the population of Tanzania; personal financial management; and to provide education to the porter service users. KGPU was founded former guide and porter, Joseph Nyabasi, with the aim of improving the welfare of those who make a living from the mountain through the same mission. Demands professionalism coupled with a variety of worker protection agencies in the mountain, making this area one of the most popular natural tourist destinations. Kilimanjaro as one of "The Big Seven" the highest mountain on every continent in the world to encourage the Government of Tanzania to clean themselves. Tanzania's readiness to welcome the tourists this nature must also be replicated by governments and observer of nature in Indonesia, where Mount Carstensz Pyramid, Papua, Indonesia IDR region, also became one of "The Big Seven". INI POSTINGAN YANG SANGAT KEREN. SAYA SUKA YANG BEGINIAN, TAPI ADA KENDALA BAHASA, JADI GAK BISA MENGERTI SERATUS PERSEN. NAMUN, BISA JUGA SAMBIL BELAJAR BAHASA INGGRIS. TRIMS! Hotel is an outstanding combination of resort facilities luxury hotel rooms hotels are expensive in dubai.